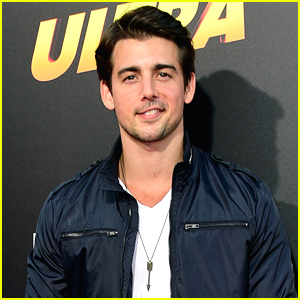 John deLuca Photos, News, and Videos | Just Jared Jr.
John DeLuca has his next movie project lined up! The 32-year-old actor who played Butchy in Disney Channel’s Teen Beach Movie will be starring in the upcoming comedy Donny’s Party. Donny’s Party is “about a 13-year-old boy trying hard to have a good time at his Bar Mitzvah party, but his stressed-out mother is horrible to him, his would-be girlfriend humiliates him, and the adults have hijacked the music, in what turns out to be a wildly inappropriate, surreal and hilarious evening,” Deadline reports. Jack Griffo & Paris Berelc Sure Don't Need an 'Arrangement' for Their Relationship! Jack Griffo and Paris Berelc pose for a cute couple photo while attending a party to celebrate the new E! scripted series The Arrangement on Wednesday night (February 15) at the Sheats-Goldstein residence in Los Angeles. The show is about a movie star who offers his latest leading lady a $10 million contract to marry him, but we’re positive that Jack and Paris don’t need any sort of “arrangement” for their relationship! Other stars who stepped out at the event included Jake Paul, Teen Beach Movie‘s John DeLuca, model Ireland Baldwin, and Breaking Bad‘s RJ Mitte. Make sure to catch the premiere of the new series on Sunday, March 5 at 10pm on E! We’re so excited that John DeLuca has joined General Hospital! The Teen Beach Movie star confirmed the news on Instagram earlier this week after the casting news hit the web. “Happy that I can finally share this with u all! Gonna be fun,” Johnny wrote on his account. According to TVLine, Johnny will play the role Aaron, a young man who crosses paths with the Corinthos family. His first episode will air Tuesday, April 26th. Laura Marano gives us a pop of color with her red top while posing with sis Vanessa on the purple carpet at Just Jared’s Way Too Wonderland Party presented by Ever After High on Thursday (August 27) at Greystone Manor in Los Angeles. The actresses helped celebrate Way Too Wonderland, the newest chapter in the storybook lives of the Ever After High royals and rebels. The series follows them as they adventure through Wonderland like never before in order to save the day. The episodes are available now as an all-new Netflix original series! Garrett Clayton & Mollee Gray Bring 'Teen Beach 2' to D23 Expo! 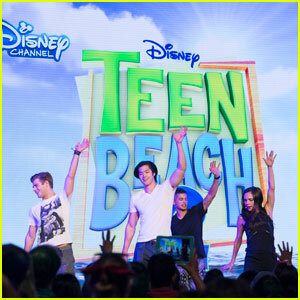 The cast of Teen Beach 2 hits the stage to perform for fans at the 2015 D23 EXPO on Sunday (August 16) at the Anaheim Convention Center in Anaheim, Calif. The group included Garrett Clayton, Mollee Gray, Jordan Fisher, Ross Butler, Jessica Lee Keller, Chrissie Fit, John DeLuca, and Will Loftis. “Who’s coming to #D23Expo tomorrow? I’ll be there from 11 to 1, come hang!” Ross tweeted.